Your website is great for waterfall addicts like myself. Just wanted to mention that the bottom 3 tiers of Kite Kite Falls are the most viewed but have attached a pic of the whole waterfall. There is another 30 metre drop above the triple section and then a series of shallow falls above that again. Must be close to 100 metres in total. You are welcome to use this pic. Also just around the corner from Piha is the Kare Kare Falls – best seen after heavy rain. 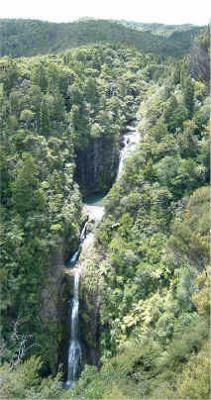 Have accumulated information on over 400 falls in N.Z. including the ‘forgotten’ falls – Bluff Falls. These are located in Westland and are the true source of the Hokitika River. They cascade 400 – 600 metres from the Bluff Hut over about a 2 km drop to the valley base. Haven’t got a photo yet as waiting on some tramper friends to take some. About (Kitekite Falls) Bigger than most people think….